Embry is a Nord lumberjack and the local drunk of Riverwood. He can always be found in and around the Sleeping Giant Inn where he is allowed to drink all night long. He starts his day at 7am, taking a one-hour breakfast in the taproom, then heads outside on the porch where he spends the next nine hours loitering around, either sitting on the bench or leaning against the railing. At 5pm he heads back inside and spends the entire evening (and night, due to a bug) drinking and dancing. Embry wears a set of lower-class clothes, a pair of hide boots, and a pair of hide bracers. He carries a selection of lower-class items and gold, and a key to the inn. He wields an iron dagger. When approached, he will often respond with a drunken: "You're kinda fuzzy. What's wrong with ya?" Other times he will walk past you while remarking "Outta my way, stranger." In the evenings he will often shout "Gimme a mug of ale." after innkeepers Delphine or Orgnar but will otherwise focus on his drinking and the performances of local bard Sven. Embry: "My favorite drinking buddy! Let's get some mead." Whiterun Guard: "Not now. If I don't pull night duty, I'll drink a round with you at the Sleeping Giant." Embry: "But I'm thirsty now." Whiterun Guard: "You're always thirsty. Just like you're always drunk. Now let me get back to my rounds." Embry: "I need some more ale, Orgnar." Orgnar: "You've had more than enough. Besides, you still haven't paid for the last one." Embry: "I'll find some coin for you. I always do." Orgnar: "Until then, I've no ale for you." "Gimme a mug of ale." "A pint of your finest mead." Embry: "How's about a drink, Hod." Hod: "You'll be wantin' me to pay for them?" Embry: "It's only right seein' as your [sic] the important lumber man." Hod: "You come do an honest day's work at my mill, and I'll pay you an honest day's wages. Then we'll drink." Embry was supposed to sleep at the inn between midnight and 7am, but he just keeps drinking. 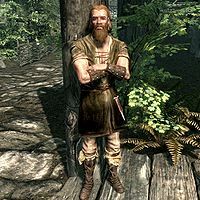 If you pickpocket Embry and fail, he will run into his room and will alternately run around and cower while speaking as if you had defeated him. He will continue cowering even if you attack him. ? This page was last modified on 11 December 2013, at 14:42.